Does the Bus to NYC Stop Here? Union Station is the home of trains and also a Metro stop, and now it is home to a new bus station for those headed out of town. 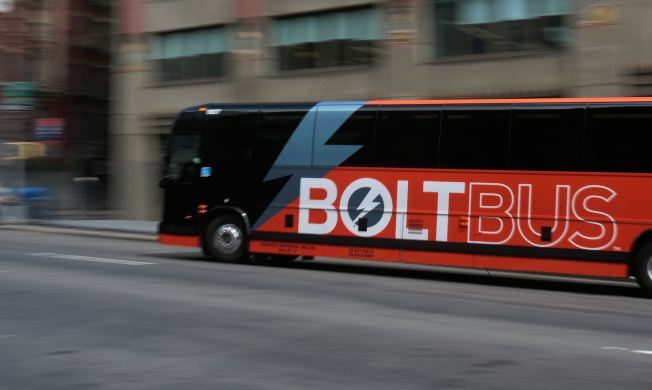 Three intercity bus companies -- Greyhound’s BoltBus, Washington Delux and DC2NY -- will be using the new facility. It’s being called the "city's first centralized bus facility" and "the first ever bus pick-up and drop-off service in Union Station's history." D.C. Delegate Eleanor Holmes Norton even got into the act, meeting and greeting the first passengers boarding busses heading out of town. District Delegate to Congress Eleanor Holmes Norton (D-DC) talks about the new Bus depot at Union Station. 2. Enter through the front doors. 3. Proceed (walk -- no cars, bikes, taxis, skateboards are allowed inside; but it seems busses are OK) through the atrium. 4. Go past the food court. 5. Find the escalators (those metal moving things that are always broken at the Metro station). 6. Proceed up the escalators. 7. Guess what! When you get to the top, they say that's the mezzanine level. 8. Look to the left for the staging area. 9. Now board a bus and get out of town. Bring us back something nice.